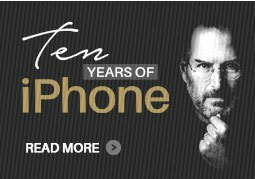 Ten years ago when Steve Jobs unveiled the first iPhone, not many would have realized that it was one of the most crucial moment for both Apple and the smartphone industry. The following years witnessed Apple’s growing affinity towards building a mobile device that would solely handle and manage every aspect of our lives and mean more than just staying connected. Over the years, the iPhone has become the main reason in pushing Apple to be the world’s most trusted and biggest brand and is responsible for driving more than 60% of its revenue. As we celebrate 10 years of iPhone in 2017, take at look at our infographic to know how it all started, the course of its journey and finally the series of industries that it impacted.